It features 22 No. Rides and Water Features in 3.1 hectares of Arabic themed heritage landscape. It’s total daily maximum capacity is 2500 people with concealed on-site car parking for 450 vehicles. It’s design was based on an Arabic children’s story of Ocean bound traders discovering it’s secluded oasis and nurturing it’s flashflood potential for themed water and wave pool rides. A complex series of exhilarating inter-linked rides set in themed rockwork wadis, with traditional use of timber and rope structures and a theatrical waterfall ‘flood event’ feature strongly in it’s design. 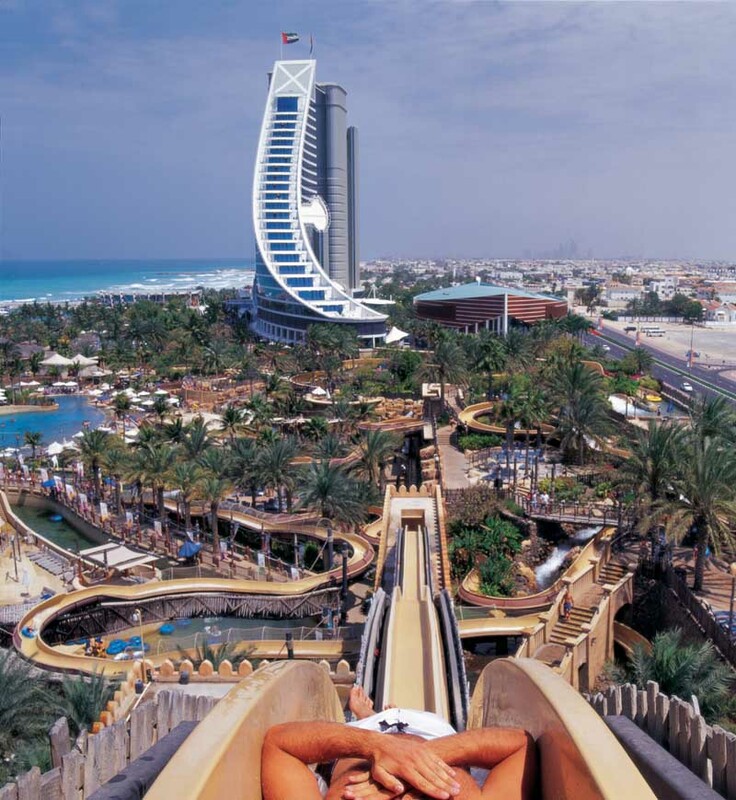 The Wild Wadi aqua park forms part of The Jumeirah Beach Resort development, on a four hectare plot located next to The Jumeirah Beach Hotel, and the access road to Burj Al Arab -The Arabian Tower. Wild Wadi is a fully themed entertainment water park, designed to give the guest the experience of a lifetime in a world away from reality. 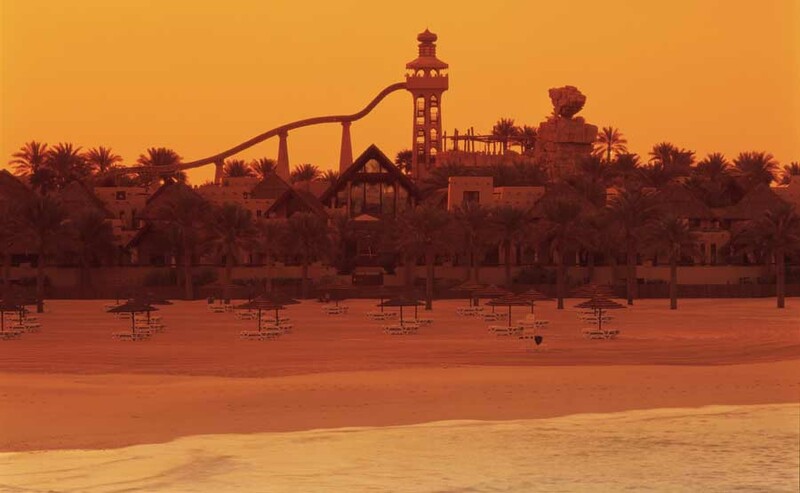 The aqua park consists of interconnecting flume rides transporting guests around the park on rubber rings within an entirely themed environment, the style and concept of which has never before been seen in the Middle East. The famous seafarer Sinbad and Juha, the last of the Knights Errant, were returning from their voyages to the Far East when they were caught in a terrible storm in the middle of the Arabian Sea. The storm lasted for three whole days and everyone thought it would never stop. Yet at the end of the third night Sinbad and his companions awoke to find that their dhow had been washed up on a tropical paradise which took their breath away. Freshwater streams cascaded from lofty outcrops of rock set amid lush groves of succulent date and coconut palms. Further exploration revealed the oasis was surrounded by mountains, with a narrow wadi leading through to a lagoon, which meant that the area was prone to flash floods. Encouraged by the children, the dhow crewmen created sophisticated tunnels and slides among the streams, so that they could enjoy a series of fast flowing rides and waterfalls. And so it came to pass that Sinbad and his companions constructed a new life for themselves in this garden of pleasure, and invited all the children forever more to come and play in their water haven. Wild Wadi contains a constant 6.75 million litres of fresh water. The aqua park has a total capacity of 2,500 guests per day, and expects to have in excess of 400,000 visitors during the first year. Wild Wadi is the first aquapark in the world to link chains of rides together so the guest never leaves the water. In a normal aquapark the guest climbs to the top of the ride waits for perhaps 20 minutes then has a half-minute ride. With the aid of Master Blaster uphill water rides the Wild Wadi guest is taken to the top of the rides in the water. In Wild Wadi it will take about 45 minuets to do a complete circuit, the philosophy of ‘enjoyed immersion’. Eight Master Blaster uphill roller coaster rides, the first of their kind in the Middle East. One triple drop speed slide -dropping 32 metres, this is the highest slide outside North America, enabling ride speeds in excess of 70kph thus becoming the fastest speed slide in the Middle East. One uphill and one downhill family tube rides – again the first of this size in the Middle East, capable of taking four people in one raft. ‘Flashflood’ waterfall wadi feature. A once-an-hour spectacular event that brings together water, light and sound and simulates a wadi flood. Body-board ‘Point Break’ Flow Rider and Body-board ‘Beach Break’ Flow Rider – both the first to be seen in the Middle East, fast streams of water are driven over curved foam surfaces creating two perfect surfing waves. Action River pulse wave- the first of its kind in the Middle East, ranging between four and five metres wide, this 150 metre canyon is prone to sudden bursts of fast-moving water which create standing waves. Lazy River – 585 metres in length, and between three and four metres wide, taking the guest on a non-stop journey around the lower areas of the aqua park.